Popular in the Southern part of the U.S., a mint julep is traditionally made with four ingredients: spearmint, bourbon, sugar, and water. The drink is quite popular. The mint julep has been promoted by Churchill Downs in association with the Kentucky Derby since 1938. Each year almost 120,000 juleps are served at Churchill Downs over the two day period of the Kentucky Oaks and the Kentucky Derby. To prepare simple syrup, mix 1 cup of granulated sugar and 1 cup of distilled water in a small sauce pan. Heat to dissolve sugar. Stir constantly so the sugar does not burn. Set aside to cool. We’ve all watched the Food Network Channel and drooled over the amazing kitchens used by chefs like Paula Deen, Guy Fieri, and the master chefs on Iron Chef America. We’ve oohed and aahed over the massive commercial stoves, the walk-in coolers large enough to refirgerate food to feed a small village, and of course the high quality pots and pans they use to create their culinary masterpieces. During the commercial break, you walk into your kitchen and shake your head. Your outdated appliances and tarnished and stained pots and pans will never allow you to reach your culinary potential. It’s time to remodel! Let’s look at your appliances first. Sure a GE Stove and Oven will cook a 20 lb turkey with ease. However, picture a Vulcan 6-Burner Range with 24″ Griddle– it’s a stainless steel MONSTER! It’s sleek 28,000 BTU/hr open top burners with lift-off heads and 35,000 BTU/hr standard oven cavity measures will make it the envy of all your friends! Round off your commercial kitchen with a refrigerator that offers stylish luxury with aesthetic appeal. Check out the True Dual Temperature Refrigerator/Freezer with 23 cu ft capacity that will blow away any standard refrigerator. It’s stainless steel exterior makes it a breeze to clean off your kids’ sticky fingerprints. It’s also one of a few commercial refrigerators that’s zoned with a two self contained independent refrigeration systems. To truly say you have a commercial grade kitchen, don’t forget about the accent pieces. Burkett Restaurant Equipment has a vast array of small wares that’ll compliment any style kitchen. A 12″ Natural Aluminum Frying Pan with insulated grip is the cook-friendly choice for any chef. Great for frying, searing, browning, and sauteing. The 15 qt Standard Weight Aluminum Brazier is made with an extra thick base for superior thermal conductivity. The reinforced rim resists dents and is easy to clean while the satin finish offers long lasting performance. The Forschner 8″ Curved Breaking Knife will compliment any cutlery set. You’ll be slicing and dicing fresh vegetables like a professional in no time! Now that you’ve got the perfectly equipped commercial kitchen, go ahead and splurge on a True Direct Draw Keg Cooler. The stainless steel countertop and galvanized interior will keep your beer fresh for extended periods of time, without losing any of the taste or quality of the beer. Once your kitchen is decked out with the finest commercial appliances and items and you go to the kitchen during a commercial break of Iron Chef America you can grin knowing your kitchen is just as amazing as the one’s on television! It’s National Strawberries and Cream Day today! Cheese Souffle is to France as Strawberries and Cream is to England. Commonly associated with the Wimbledon, strawberries are one of a a few fruit that grow in England therefore making it a beloved snack for natives. Every year about 27,000 kilos of strawberries are eaten during the Wimbledon Tennis Championships, together with 7,000 litres of cream! Unlike many of our other National Food Days recipes, making Strawberries and Cream is rather simple! Step number one- get British! Then follow this recipe and enjoy! Wash, dry, hull & chop the strawberries with a good paring knife. Drizzle hone/nectar or the sugar on the strawberries and let them sit for about 15 – 30 minutes. Melt the semi sweet chocolate & in the microwave; mix in some of the cream to form a chocolate mix like a thick ganache. Whip the rest of the cream till it holds stiff peaks. Layer a cup with the cream, then with the chocolate ganache, then some strawberries; make as many layers a you want. Garnish with chocolate wafers & fresh mint. Are you feeling a little French today? Make a Cheese Souffle for breakfast! Simply explained, Cheese Souffle is a puffy cake-like dish of cheese and eggs. While most of the National Food Day recipes that we have shared with you have been pretty simple to create, if you’ve made a Cheese Souffle before, you know that while it is not an easy task, it is well worth the struggle. 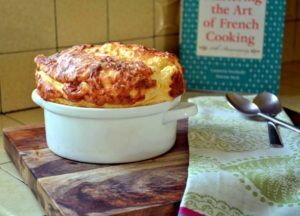 So, go ahead, relieve your urge to be the next Julia Child, crack some eggs and indulge in this delicious recipe for Cheese Souffle! Generously butter a 7 ½- to 8-inch diameter soufflé dish. Roll the grated Parmigiano Reggiano in the buttered baking dish to cover the bottom and side. Set the oven rack in the lower third of your Southbend Gas Burner Range, and preheat to 400 degrees Fahrenheit. To make the béchamel: Over moderate heat, melt 2 ½ Tbs butter in a 2 ½-quart saucepan; then blend in the flour with a wooden spoon to make a smooth but somewhat loose paste. Stir until the butter and flour foam together for two minutes without coloring to more than a buttery yellow. Remove from heat. When the bubbling stops, in a few seconds, pour in the hot milk all at once, whisking vigorously to blend. Place the saucepan over moderately high heat, whisking rather slowly, reaching all over the bottom and sides of the pan, until the sauce comes to the simmer. Simmer two to three minutes, stirring with a wooden spoon, until the sauce is very thick and coats a spoon nicely. Whisk in the seasonings, and remove from heat. Whisk the egg yolks into the hot sauce one by one, transfer sauce to a large bowl, and set it aside. To finish: In a clean bowl and use an Immersion Blender to beat the egg whites to stiff shining peaks. Scoop a quarter of the egg whites into the bowl with the sauce, and stir together with a wooden spoon. Turn the rest of the egg whites on top; rapidly and delicately, fold them in with a rubber spatula, alternating scoops of the spatula with sprinkles of the coarsely grated cheese. Pour the batter into the prepared baking dish, and use your spatula to trace a circle in the top of the batter, just inside the rim of the dish. This will help the soufflé to rise freely. Place the soufflé in the oven, and turn the oven temperature down to 375 degrees Fahrenheit. Bake about 25 to 30 minutes (without opening the oven), until the soufflé has puffed one to three inches over the rim of the baking dish and the top has browned nicely. Serve immediately, because yes, it will deflate within a few minutes. To serve without crushing it, use two serving spoons pointed down and back-to-back; plunge them into the crust and tear it apart. Shrimp is the fruit of the sea. You can barbecue it, boil it, broil it, bake it, saute it. Dey’s uh, shrimp-kabobs, shrimp creole, shrimp gumbo. Pan fried, deep fried, stir-fried. There’s pineapple shrimp, lemon shrimp, coconut shrimp, pepper shrimp, shrimp soup, shrimp stew, shrimp salad, shrimp and potatoes, shrimp burger, shrimp sandwich. That- that’s about it. Here’s a fun shrimp recipe that we’re sure you’ll love! Pou half of mixture in a glass bowl and cool. Once cool, add shrimp to the mixture and marinate 1-2 hrs in a Tru Refrigerator. For Glaze: Pour remaining puree into a medium saucepan. Add brown sugar, OJ and adobe sauce. Over medium-high heat bring to boil, then reduce heat and simmer until slightly thickened (10 minutes). Remove from heat and set aside. Preheat Vulcan Charbroiler. Remove shrimp from marinade and pat dry. Thread shrimp onto skewers and brush with glaze. Grill until shrimp turn pink- about 2 minutes/ side frequently brushing with glaze. Remove from heat and serve immediately. Well, for whatever reason, you may be celebrating Cinco de Mayo today, celebrate it with an ice-cold Margarita! Try this recipe below. 1. Use your Vitamix 48 oz Bar Blender, combine watermelons, limes, sugar, and iced cubes. Blend until smooth. 2. Add Tequila and Grand Marnier or Triple Sec and pulse to blend. 3. Rim each Margarita Glasses with salt and add more ice to the cups. Pour the mix over the ice and serve cold!! Enjoy! So here we are the first day of May- the smell of summer is in the air. I don’t know about you guys, but when I think summer, one thing comes to mind- STRAWBERRIES!! Not the ones you buy in January that are way overpriced and void of taste. I’m taking about juicy plump red strawberries- summer strawberries! There’s a good reason why strawberries are honored in May- they are the first fruit to ripen in the spring and when you think about the spring, the month of May immediately comes to mind. Here’s a bit of useful information for you: Did you know that eight strawberries provide 140 percent of the recommended daily intake of Vitamin C? So go ahead and splurge on eight, sixteen, or as many as you want without feeling guilty. Hold on though! If you’re going to indulge- don’t add sugar or Whipped Cream. Enjoy it in it’s natural state to make it a healthy snack. However, every now and then (or more often!!) you just have to splurge. Why not splurge on this…..
Crust, Preheat your Blodgett Double Deck Gas Convection Oven to 400 degrees. Combine crust ingredients and press over 9×13 baking pan. Bake 8 minutes (do not over bake!) Let cool. Filling: Using a hand mixer or immersion blender, beat ingredients until creamy. Spread over pretzels. Chill for 20 minutes in a True 2 Door Dual Temp Reach-In Refrigerator/Freezer Combo. Topping: Dissolve gelatin into water. Add strawberries. Let stand until primarily set, then spread over filling. Chill until set!